Death*: Lisabetha Bruner died; Y. Birth*: She was born on 5 November 1713 in Basserstorff, Zurich, Switzerland. She was the daughter of Kilian Bruner and Verena Altorffer. Death*: Jakob Bruner died; Y. Birth*: He was born on 17 December 1715 in Basserstorff, Zurich, Switzerland. He was the son of Kilian Bruner and Verena Altorffer. Death*: Hans Jakob Bruner died; Y. Birth*: He was born on 24 October 1717 in Basserstorff, Zurich, Switzerland. Death*: Kilian Bruner died; Y. Birth*: He was born on 28 April 1720 in Basserstorff, Zurich, Switzerland. Death*: Hans Felix Bruner died; Y. Birth*: He was born on 20 February 1724 in Basserstorff, Zurich, Switzerland. Death*: Magdelena Bruner died; Y. Birth*: She was born on 6 July 1727 in Basserstorff, Zurich, Switzerland. Birth*: Oswald Bruner was born on 6 August 1643 in Basserstorff, Zurich, Switzerland. He was the son of Hans Bruner and Anna Altorffer. Marriage*: Oswald Bruner married Anna Rathgeb in 1671. Death*: Oswald died after 1690 in Basserstorff, Zurich, Switzerland. Death*: Anna Rathgeb died; Y. Married Name: Her married name was Bruner. Birth*: She was born in 1651 in Dietlikon, Zurich, Switzerland. Marriage*: She married Oswald Bruner, son of Hans Bruner and Anna Altorffer, in 1671. Birth*: Hans Bruner was born on 24 March 1617. He was the son of Kilian Bruner and Barbel Schmid. Marriage*: Hans Bruner married Anna Altorffer in 1640. Death*: Hans died after 1650 in Basserstorff, Zurich, Switzerland. Death*: Anna Altorffer died; Y. Birth*: She was born in 1619 in Birchwell, Zurich, Switzerland. Marriage*: She married Hans Bruner, son of Kilian Bruner and Barbel Schmid, in 1640. Birth*: Kilian Bruner was born on 2 October 1571 in Basserstorff, Zurich, Switzerland. He was the son of Ulrich Bruner and Margaretha Leimbacher. Marriage*: Kilian Bruner married Barbel Schmid in 1612. Death*: Kilian died after 1620 in Zurich, Switzerland. Death*: Barbel Schmid died; Y. Birth*: She was born circa 1592 in Basserstorff, Zurich, Switzerland. Marriage*: She married Kilian Bruner, son of Ulrich Bruner and Margaretha Leimbacher, in 1612. Birth*: Ulrich Bruner was born in 1527 in Basserstorff, Zurich, Switzerland. Death*: Ulrich died after 1580 in Basserstorff, Zurich, Switzerland. Birth*: Margaretha Leimbacher was born in 1531 in Oberwil, Zurich, Switzerland. Death*: She died on 30 November 1589. 2. [S316] Unknown name of person unknown record type, unknown repository, unknown repository address. 3. [S317] Letter, Sandra Mollenhour to Jo Arnspiger, 10 July 1983. Marriage*: He married Sarah unk circa 1882. 1. Variant spelling Arnsberger. Wife named Sarah. 2. [S317] Letter, Sandra Mollenhour to Jo Arnspiger, 10 July 1983. 1. [S317] Letter, Sandra Mollenhour to Jo Arnspiger, 10 July 1983. Marriage*: She married George Arnspiger circa 1882. 1. [S318] Lynn Roberts, "Arnspiger, Charles email," e-mail to Jo ARnspiger, 11/3/04. 2. [S342] Film, unknown repository address, Espanola, Rio Arriba,, New Mexico. 3. [S319] 1930 unknown record type, unknown repository address. Birth*: Elizabeth Ernstberger was born circa 1740 in Lancaster, PA; This is congecture only because Paul, Christopher and Ulrich Ernstberger were all sponsors at the baptisms of George Meyer(Mayer) and his wife Elizabeth. She was the daughter of George Heinrich Ernsberger and Maria Magdalena Rausch. Marriage*: She married George Mayer. 2. [S310] 2, Lancaster Church Records: p 130, unknown repository. 3. [S310] 2, Lancaster Church Records, unknown repository. Birth*: George Mayer was born before 1739 in Lancaster, PA. Marriage*: He married Elizabeth Ernstberger. 2. [S262] John T. Humphrey, PA Births. 3. [S310] 2, Lancaster Church Records: p 130, unknown repository. 4. [S310] 2, Lancaster Church Records, unknown repository. 1. [S310] 2, Lancaster Church Records: p 130, unknown repository. 3. [S310] 2, Lancaster Church Records: P130, unknown repository. 2. [S310] 2, Lancaster Church Records, unknown repository. 1. [S310] 2, Lancaster Church Records, unknown repository. 1. [S98] 1860 unknown record type, unknown repository address, Illinois, Macoupin county. 1. [S319] 1930 unknown record type, unknown repository address, College Park, Fulton, GA.
1. [S281] Film, unknown repository address, Centreville, Wilkinson county, MS 14:3:147. 2. [S336] 14 April 1910 Film, unknown repository address, 3/3. 3. [S319] 1930 unknown record type, unknown repository address, Baton Rouge co., LA. 1. [S102] 1900, US Soundex , Wilkinson co, MS.
2. [S335] 6 June 1900 Film, unknown repository address, 96/106. 1. [S314] 1870 Ancestry census extraction, unknown repository address, age 7 years, Crawford county, Indiana, Ohio twp. .
2. [S314] 1870 Ancestry census extraction, unknown repository address, age 7 years, Crawford county, Ohio twp, Indiana. 3. [S330] IN Marriages to 1850, online http://199.8.200.229/db/Marriages_results.asp?pagenum=3. 1. 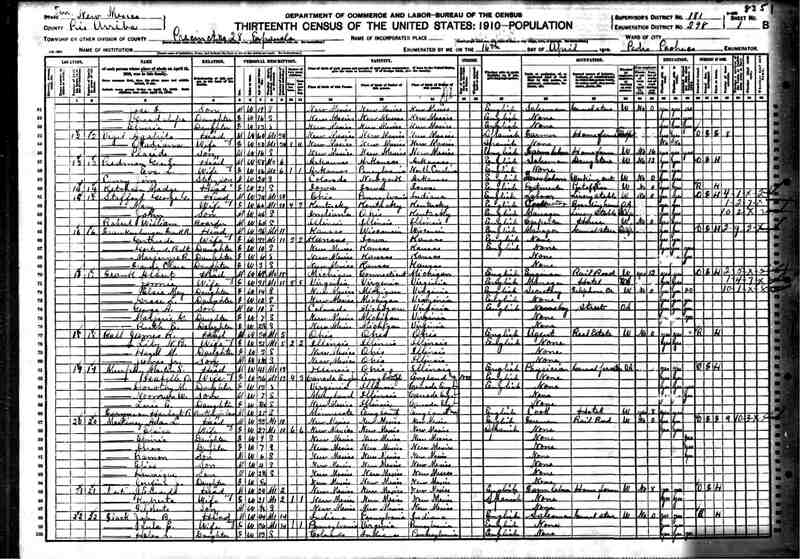 [S314] 1870 Ancestry census extraction, unknown repository address, age 7 years, Crawford county, Ohio twp, Indiana. 2. [S330] IN Marriages to 1850, online http://199.8.200.229/db/Marriages_results.asp?pagenum=3. 1. [S334] 10 July 1860 Film, unknown repository address. 2. [S334] 10 July 1860 Film, unknown repository address, 433/430. 1. [S281] Film, unknown repository address. 1. [S241] Census, unknown repository address, District 16, Jasper co, IA. 1. [S241] Census, unknown repository address, Columbus city twp, Louisa co, Iowa. 2. [S241] Census, unknown repository address, Columbus city twp, Louisa co, IA. 1. [S241] Census, unknown repository address, Columbus city twp, Louisa co, IA.